All photographs must be uploaded onto the online application forms for auditions and intensive courses. Emailed photographs are not accepted. Remember to name each individual image and adhere to the requirements shown below. 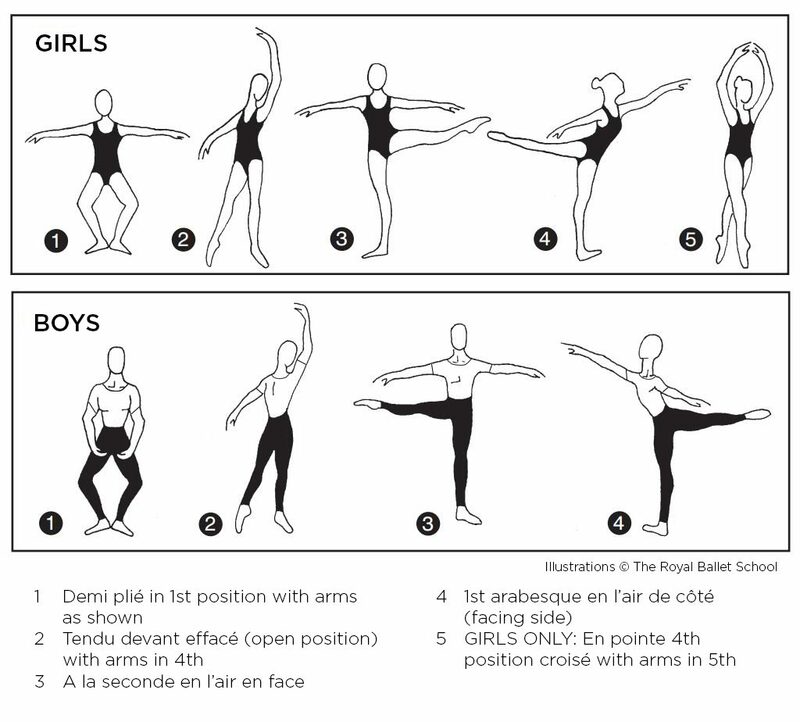 The positions shown in the diagrams for Junior Associate entry are visual guidelines only, for other programmes please also read the detailed descriptions of the positions and speak with your regular dance teacher and with their guidance practise the positions in front of a mirror before taking the photos. It is not a requirement to use a professional photographer, however we advise you to transfer images from your phone (if used) onto a laptop or pc to upload onto the online application. Applications are accepted from candidates in current School Years 3, 4, 5 (aged between 8-10 years on 31 August 2019) or Scottish equivalent P4, P5, P6. Female dancewear: for photographs and when attending an audition class girls should wear a plain-colour leotard (simple-style: no skirt, no frills, lace, high fancy neckline or multi-straps), short ballet socks and bare legs (no tights), ballet shoes with elastic (no ribbons). Hair neatly groomed. Male dancewear: for photographs and when attending an audition class boys should wear a close-fitting t-shirt or dance leotard, dance shorts or plain-colour swimming trunks, short white socks and bare legs (no tights), ballet shoes. Hair neatly groomed, if long please tie back (no headbands). Please do these photos if applying for a Junior Associate course. Female dancewear: for photographs or when attending an audition class girls should wear a plain-colour leotard (simple-style: no skirt, no frills, lace, high fancy neckline or multi-straps). Girls aged 10 years & 11 years (School Years 6 & 7 entry level) should have bare legs (no tights), short ballet socks and shoes. Girls aged 12 years (School Year 8 entry level) may wear pink ballet tights. Hair neatly groomed. No make-up. Male dancewear: for photographs or when attending an audition class boys should wear a close fitting t-shirt or dance leotard, dance shorts or mid to dark colour footless tights (not white), short white socks, black or white ballet shoes. Hair neatly groomed, if long please tie back (no headbands). Please do these photos if aged 11 or 12 at 31 August 2019 or age 10 at 31 August 2019 if applying for Spring/Summer Intensive Courses. Female dancewear: for photographs and when attending an audition class, female dancers should wear a plain-colour leotard (not white, simple-style: no skirt, no frills, lace, high fancy neckline or multi-straps), pink tights, soft shoes and pointe shoes (fig.5 photograph, in pointe shoes only if already working on pointe, if not yet on pointe do this position in soft shoes on demi). Hair neatly groomed. Subtle/natural make-up only, if worn. Male dancewear: for photographs and when attending an audition class, male dancers should wear a close-fitting white t-shirt or leotard, mid to dark colour tights (no white tights, no dance shorts), white socks, black or white ballet shoes. Hair neatly groomed, if long please tie back (no headbands). Please do these photos if aged 13-18 at 31 August 2019 for full-time training, Mid, Senior & Advanced Associates and if aged 13-20 for Spring/Summer Intensive Courses.